Art and Medicine Bibliography, James John Durant, and others. Medical reports upon the character and progress of leprosy in the East Indies, being answers to interrogatories drawn up by the Royal College of Physicians, London. Corp. Authors: Durant, James John, (1831–1913), and others. Calcutta : J. L. Kingham, Foreign Department Press, 1865. Description : 500 p., [1 l.] pl. ; ill.: 4 phot. ; 31 cm. Photographs : 3 albumen stereographs mounted on 1 leaf, each representing a leper sitting on the ground. Photographer : Lieutenant William Henry Cornish (1840- ). Subject : Skin — Leprosy. Author caption: By J. J. Durant, ESQ., M. R. C. S. L., Civil Assistant Surgeon, and Superintendent, Government Dispensary, Pooree. Corp authors: Great Britain. Secretary of State for India, Committee for the Royal College of Physicians, et al. Assistant Surgeon, Indian Medical Service, 1859. Surgeon, Indian Medical Service, 1871. Surgeon Major, Indian Medical Service, 1873. Photographer identified on p. 39. With a view to illustrate the different forms of the disease as it is met with here, as I stated I would, if possible, in the progress of this paper, I have much pleasure in sending herewith two cards, having mounted on them four beautiful little photographs of four different Lepers, and showing the tubercular and mutilated forms of the diseases. I am indebted for them to Lieutenant W. H. Cornish, of the Bengal Military Police, who is an excellent practical Photographer; they are taken from patients in Hospital: they are accurately correct illustrations of the disease, and so will, I trust, be considered highly instructive, and, conveying as they do a far more perfect idea of the nature and appearance of the malady than could be done by any amount of word painting, will be of much value; the photographs are numbered 1, 2, 3, and 4. No. 2 is that of a young boy, named Kropa, aged 12, and shows the tubercular form of the disease as it attacks the face and hands, presenting a most revolting appearance, as will be seen; the parts chiefly affected being the nose, lips, and ears; the fingers are thickened and the end joints swollen, with ulcerations commencing in the ends of some of them.—Vide Table, Case No. 16. No. 3 and NO. 4 are cases of a young boy and a young man; they both show the same form of the disease, the only difference between them being in the form of the mutilans : they are most pitiful and revolting cases to behold, and occur very commonly about here. These cases will be found in the Table, and are numbered 20 and 40 respectively. In No. 3 all the metatarsal bones of the right foot had dropped off, causing it to appear like a stump after Hey’s operation, while several of the fingers had lost their joints, and were otherwise contracted and distorted. No. 4 has much the same kinds of mutilations and distortions. It is much to be regretted that a larger lens was not at hand to have given larger pictures of these cases, but with the aid of a common magnifying glass, however, they can easily be seen to much advantage. 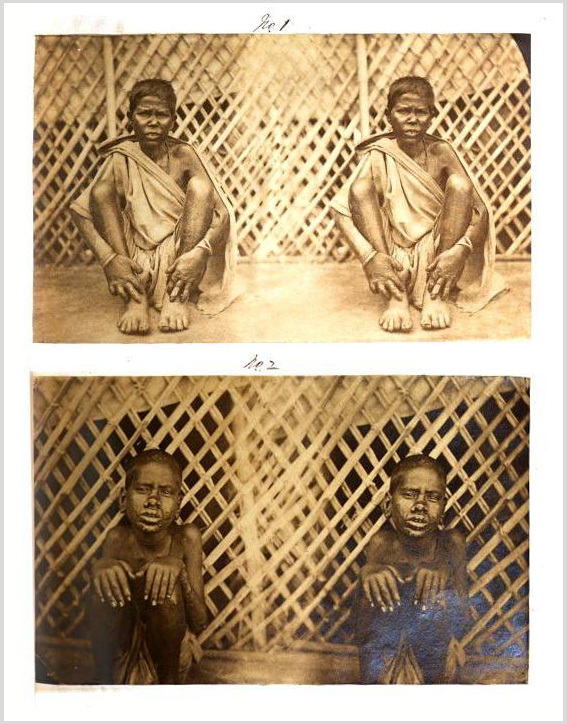 Stereographs are uncommon in the published medical literature of the 19th century. The ones I have seen are typically mounted on cards that are loosely placed in the book or journal, or they are secured in a pocket attached to the inside cover. Without the use of a Holmes viewer, however, it requires a steady, coordinated focus of the naked eyes to see the three-dimensional forms hidden in a stereograph that is pasted on the page of a book. An athletic ability of the eyes, easily mastered with a little patience, will reward the photography scholar with visual marvels—these stereographs by William Henry Cornish really pop out! After serving in the military, Cornish became District Superintendent of Police at Cuttack. He photographed for the archeological digs sponsored by the Indian Museum.